Photo by Axel Marcenaro: Students clap after a heartfelt recital of a pro-women poem. Students and faculty were encouraged to deliver quotes or poems and received a free gift afterwards. 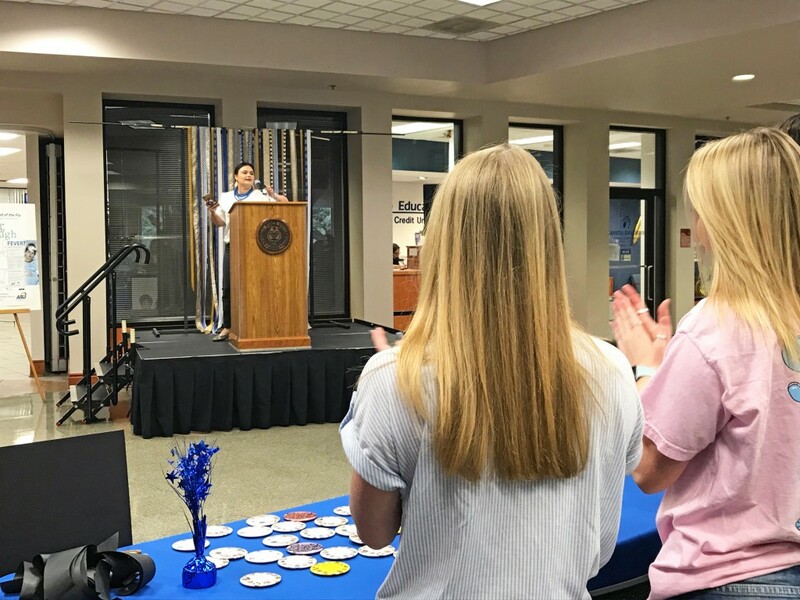 The Multicultural Center welcomed attendees to the Houston Harte University Center lobby on March 8 for the Women’s History Month Celebration. The event highlighted the importance of how women got to where they are now and the support that brings them together. The helpers at the event displayed written quotes along the tables to inspire women to speak their minds and be confident in their bodies. Many of the helpers also encouraged attendees to join them to take advantage of the opportunities that exist for women and to gain the support they need for the future steps of equality. There were options to donate feminine products to help women who need to care for themselves and to show the endless assistance women have for each other across the world. Torres said the Multicultural Center has a Ram Pantry for any student who needs personal hygiene products and it even includes feminine products. There were also poems individuals could recite on stage to feel the power of confidence and what women in the past had to go through in order to be heard.